Ludum Dare #33 is months old, and the next Ludum Dare is about to begin. 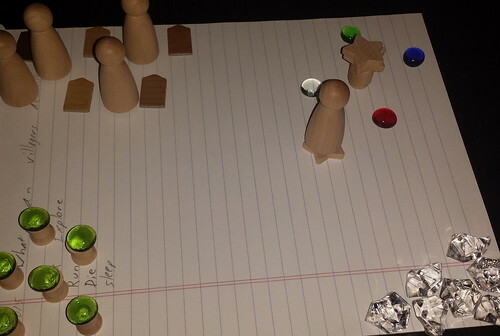 It’s about time I wrote a post-mortem about the game I submitted. The theme was “You Are the Monster”, which, as usual, caused a lot of panic among the participants who worried that it was impossible to make a game based on that theme in two days. And once again, despite such worries, there were almost 2,000 entries submitted, so people found a way to do it. I ended up making a fairly compelling, somewhat humorous, non-violent strategy game about being an imprisoned evil using its influence to escape. I called it Free Me, You Idiots! It’s easy to want to get started right away. You only have 48 hours, and every second counts. But I also knew from experience that it helps to spit out as many concepts as possible early on, then pick the one that seems most promising. You are more likely to have a good idea picking the best of a thousand ideas versus the best of ten ideas. So I spent the first couple of hours thinking, doodling, and discussing with people on IRC. The theme had a lot of obvious and not-so-obvious applications. The obvious choice is to harvest ideas from classic movie monsters, such as vampires, werewolves, and ghosts. It’s direct, and you could have monsters who are genuinely scary or you could have them be misunderstood by the populace. The next-most-obvious choice is to think about metaphorical monsters, such as people who have the most evil and disturbing thoughts. It could be a psychological thriller in game form. I thought about characters, origin stories, and settings, and I had a lot of fun thinking up ideas as varied as space aliens and beings frozen in the Arctic for centuries. I went with the idea of the incarnation of evil imprisoned in a tree for centuries. With no previous story, I was free to write my own with no preconceptions. I fell in love with the idea, which really helped me drive the development of the game. If I hadn’t spent time upfront thinking, I might have settled for a merely OK idea, and I might not have found myself as passionate to work on it. I spent quite a bit of time thinking about this concept. I threw out a lot of ideas early on and managed to find the core of the game. 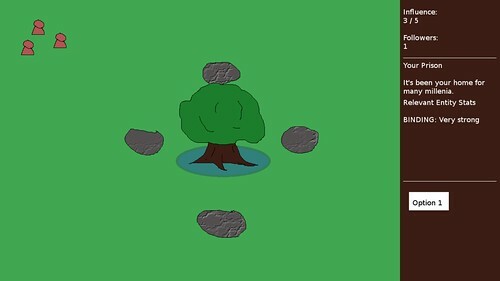 I had originally thought about having a bunch of stones surrounding the tree that you were imprisoned in that had to be removed by the nearby villagers under your influence. I mocked them up and played with the idea for awhile. The idea was that rock-gathering was an activity for the villagers, and the villagers would grab these forbidden rocks. I’m glad I threw it out because I ended up having entities that did hardly anything but explore and pray. I would have run out of time without a way to remove those rocks and finish the game. 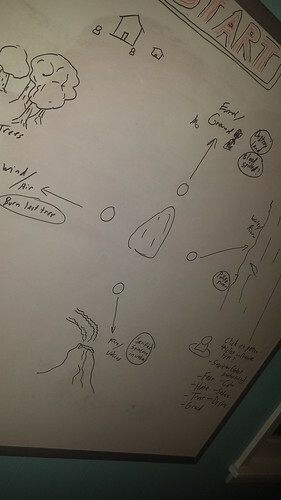 I think if I had more than two days that those rocks would still be in the game and the entities would be mining, chopping down trees, and more, but because I had a wealth of ideas to choose from, discarding some didn’t feel like I was gutting the game of its essence. In the previous Ludum Dare, I spent a lot of my time on animations and art, but not much at all on game play. By the end of that compo, which had a theme of “An Unconventional Weapon”, I had a monster that could chase around the player when you got his attention either by shouting at him or by crossing his line of sight. I wanted the monster’s head to turn separately from the body, and there was going to be this idea that the monster can trip over itself when it is moving in the opposite direction that it was looking. I spent a too much time creating the complex animation system when I could probably have gotten away with something simpler, and as a result, what I submitted wasn’t anywhere near a finished game. I didn’t want to make that mistake again in Ludum Dare #33. Even so, I didn’t start writing code until the compo was well underway. While I was worried that I wasn’t going to make everything I wanted by the deadline, my approach meant I was always going to have something to submit. My first focus was on interactivity. If the player can do something, I can build upon it, even if I have to cut most features or change the direction of the game design completely. It meant I was also playing the game frequently. I would make a change and immediately see how it felt. I can identify things that may be buggy or hard to understand, and I can fix them immediately or prioritize them. For instance, when clicking on an entity in the game, an arrow appears over them. This was a simple bit of polish that I thought seemed important enough to add early on. With a bunch of entities moving about, this arrow meant it was easy to identify which entity you were looking at. But moving around the world was a bit jarring. You click, and the camera centers to that location. I knew I wanted to add interpolation to smooth the camera’s movement, but I also knew that what I had was passable and could be fixed if I had time for polish later. So the working yet jarring camera movement stayed throughout the rest of the game’s development. What was exciting was that by making small yet meaningful changes, it allowed me to add a relatively complex economy without much effort. The game features a few variables that are interdependent and make it feel quite rich to explore. For instance, the player has Evil Energy to use to influence villagers. Evil Energy replenishes one point every second. The number of followers influences the amount of maximum Evil Energy a player has. More followers meant more maximum Evil Energy, which opened up options for the player. When you have followers, they will pray to you. When the total amount of prayer time exceeds 10 seconds, the player gets an extra point in Prayer Energy, which can be spent on upgrades and ultimately on the ESCAPE option, which ends the game in victory. I originally didn’t intend to add so much because I was worried about spending too much time on balancing all these variables, but without all of these different values and their interactions with each other, the game felt very simplistic. I’ll admit feeling worried that I might find that the whole thing was unworkable and would result in nothing but wasted time. Learning about and playing with game economies from the book Game Mechanics: Advanced Game Design by Ernest Adams and Joris Dormans gave me some confidence I could pull it off by adding pieces of it throughout development and building upon them iteratively. Each addition was relatively risk free and easy to fiddle with. I was very pleased with the results, and so were the people who played the game. I was surprised by how many actually played it all the way to completion! I realized that back in pre-20 Ludum Dare compos, it was easy for me to play almost everyone’s games because there was less than 100 entries. There would be a burst of game development activity for a weekend, and then maybe a week of playing and rating games, and then going back to regular life. Plus, back then you didn’t need to rate games to get your game rated. Today, with thousands of entries, it takes much more of a commitment. Your game won’t show up in the random sampling for entrants to rate if you don’t also rate other games. It’s a fair system. After the compo, I was on vacation from the day job and so I spent the next few weeks playing games. I set myself a Coolness goal. I figured that if I played a handful of games a day consistently for the next couple of weeks, I would be able to hit it. And when I rate games, I like to give feedback to the developer. I don’t just post “Nice!” or leave no comment at all, so I wasn’t going to allow myself to speed through reviews in order to quickly increase my Coolness. I was going to play games, give them a fair shot, and give an honest review with constructive feedback. I only got 63% Coolness, but it was enough to earn me a bronze medal. I don’t understand how that percentage is calculated. 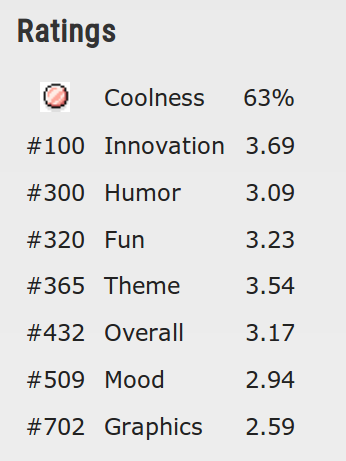 I know I didn’t rate anywhere near 63% of the nearly 1,199 games submitted, yet it seems like I could have hit 100% with only a few more handfuls of rated games if my math was correct. But I know that if I hadn’t set a Coolness goal, I would have either made the mistake of not rating enough games, resulting in my own game not getting rated by many participants as in past recent compos, or I would have spent a lot of my waking hours doing nothing but playing LD games, ignoring my other responsibilities. I think I had the balance mostly right. In an effort to speed development along, I did the opposite of what I did in the previous Ludum Dare compo and ignored animation and polish as much as I could. It wouldn’t matter how cool something looked if the player had nothing interesting to do. As a result, the game lacks life. The entities move around without turning or animating, and there is no indication when a player successfully influences someone. The grass tiles had markings which were too subtle and resulted in a sea of green that made it difficult to tell if the player was actually moving the camera. Now, it wasn’t completely bad. The prayer bubbles added a nice touch, as did the Evil Energy ball in the HUD scaling quickly when it replenishes. The flavor text had some humor and lore. But no sounds, no animations, and no special effects left the game feeling like a lot was missing. There were a few problems with the custom engine I was using. One was something I saw in the last Ludum Dare in which tiles would seem to separate as you moved the camera around. It turned out to be a floating point error that resulted in me accidentally scaling the tiles so they would sometimes be one pixel smaller in width and/or height. I must not have pulled in the fix when I was putting the project together, so I easily fixed it, but it still took me some time to figure out what exactly I was missing. Early on I noticed that entities seemed to walk over the tree. They should look like they are in front of the tree when standing in front of it and behind the tree when they were behind it. So why were they always appearing on top of the tree no matter where they were? I recently ported my code from libSDL to libSDL2, and sprite rendering was done differently to accommodate scaling and rotation. Unfortunately, I introduced a Z-ordering bug which, after spending time on figuring out what was going on, I decided to ignore for this compo rather than spend more time trying to fix it. The risks of using your own code instead of a ready-to-go engine such as Unity or Game Maker is that infrastructure bugs like this are not only likely but also might be something you feel inclined to fix immediately. If Unity had a bug, I’d work around it because I’d have no other choice. If my own code has a bug, I’d feel like I could fix it while working on my game and might underestimate the effort it would take to do so. So while it wasn’t fatal, I had buggy infrastructure code that slowed me down and prevented me from making a better game. One of the upgrades in the game is CAUSE FEAR. Do you know what it does? If you guessed it caused the villagers to be afraid, you would be wrong. Because I never got around to it. I had ideas for what CAUSE FEAR would do, but since so much of the game didn’t get made, such as the mining and wood cutting I mentioned earlier, there was no real reason to cause villagers to be afraid. Maybe it would make them pray harder for a bit, and so CAUSE FEAR was similar to trading Evil Energy for Prayer Energy but in an indirect way. Similarly, because there was no real conflict in the game, there was no challenge. There is nothing in the game that prevents you from converting every villager, getting all of the energies you need, and winning the game. I wanted the good villagers to try to convert back your followers. I wanted different kinds of villagers, such as priests and acolytes, and have their presence force you to change your tactics. Perhaps if your followers got numerous enough, the other villagers would go to war with them. But instead, there’s nothing. There’s enough economy and variety that it seems to hide this lack of conflict, but without conflict, I can’t really say I have a complete game. Throughout the compo, I set myself goals. I set an initial goal of settling on a concept within two hours. I set a goal of having interactivity early on instead of waiting until the end. I set a goal for rating games after the compo. Each goal gave me some control over the outcome. I was able to focus on what was needed and ignore what wasn’t. While the lack of polish hurt, it wouldn’t have hurt nearly as much as having a fairly incomplete experience. What really helped in setting goals was having a design document for the project. Now, I’m not talking about a 300 page document that no one reads. I’m talking about a living document that changed throughout the 48 hours I used it to help guide me. Everything I thought of went into that document, which allowed me to assess what was a priority and what was nice to have and what didn’t need to be there at all. I could see what was left and compare it to how much time I had left, and I could make intelligent decisions about feature cuts and what had to be there no matter what. I credit Hybrid Mind’s Ludum Dare #29 timelapse for In the Black for showing me how effective a design document can be for even a short 48-hour project. Thanks, Dave! I was glad I decided to risk adding more to the economy of the game. Evil Energy and Prayer Energy play off each other in an intuitive way, which makes the game more compelling. I think people kept playing because throughout the game there was always something to aim for. Converting a follower resulted in an upgrade being made available, which required Prayer Energy to attain, which in turn allowed more followers to be converted more easily, all with the aim of using ESCAPE to end the game. I could have had a simpler economy. If I eliminated Prayer Energy and made things more directly available, it could have worked, but it might have felt too simplistic. What I’m not happy about is that the richer economy hides a lack of challenge. I don’t want to use economic designs to act as a bandage on a fundamentally broken game. But I did learn that doing a decent job designing an economy can result in a great return on investment. During the 48 hours of Ludum Dare #33, I slept, I ate, I showered, I talked with my wife, and I blogged. But most of my time during the 48 hours was spent on design and implementation. According to my records, I did a little over 24 hours of game development between Friday and Sunday. Just over half of the time spent on the compo was spent doing actual game development, and I’m pretty sure that because I lived and breathed this project, I was even making progress while showering or eating. Even with the failings I mentioned, I can see that this laser focus was the real reason why I was able to get a decent game finished. I’ve done compos in which I was distracted, and they didn’t always end well. Either I was dealing with poor health, in which I couldn’t sit at my desk for long periods of time, or I was going to a party or a soccer match. For this Ludum Dare, I made sure that I was 100% focused on the compo with no outside commitments to keep me from doing anything but game development that weekend. It was grueling and exhausting, but that concentrated effort made things move along so much more quickly than if I had spread out the development effort with frequent and potentially long breaks. I’m not saying breaks are bad. I took breaks. I am merely saying that my mind was focused on game development and not on how to interact with other human beings in a social situation or how frustrating it is when your team is losing due to the same blunders they always make. I rested when I needed to rest, but I didn’t allow myself to procrastinate or do much of anything other than participate in this compo. I credit my ability to focus that weekend on game development almost exclusively, and all of the tools that allowed me to leverage that focus, such as my design document and setting milestones. The main complaint from players is that there was a lack of music and sound, followed by the noticed lack of challenge. For future compos, I’ll want to focus on not only interactivity but also adding real conflict. I may want to experiment with adding audio iteratively. Normally I add it at the end, and an informal survey indicated that a lot of other game developers add it at the end as well. I wouldn’t want to spend time on something that might get thrown out before the end. Still, the idea is that if I can have a playable game early on in a compo, I can also have a playable game with audio early on in a compo, too.